The Harvard University Affirmative Action lawsuit says more about wealth than about race. What little solace we had from Abigail Fisher losing her anti-affirmative action case against the University of Texas, is now under threat as a new legal case is underway against Harvard University. The current lawsuit that alleges Harvard University discriminates against Asian-Americans student applicants is not a lawsuit claiming “reverse racism” or racism against white people. Rather, the lawsuit argues that the university’s admission policy, which considers “personality,” discriminates against a racial group by often times scoring them lower according to likeability, courage, kindness, and being “widely-respected.” On the surface, this challenge to affirmative action aims to highlight concerns with racial bias. But at its core, it highlights the privilege of wealth and the emergence of a new elite category in the United States, most of whom are first-generation Chinese immigrants. First, anti-affirmative action lawsuits today are a misnomer. That is, these lawsuits, such as the ones against Harvard University and the University of Texas, challenge one component from numerous factors that makeup admissions policy. This is by no means equivalent to historic affirmative action policies that created blanket preferential treatment for applicants from specific racial and gender demographic groups. The Supreme Court has deemed such cases unconstitutional, ruling against demographic quotas in the Regents of the University of California v. Bakke, and the right of states to ban racial and gender preferences in 2014 under Schuette v. Coalition to Defend Affirmative Action. However, the Court continues to maintain that the use of race in university admission policies is constitutional, as long as it was only one factor among many. Now for the first time, an anti-affirmative action case argues that affirmative action policies discriminate against a class protected by federal civil rights laws. Most anti-affirmative action lawsuits have been made and won on legal arguments that prove “reverse racism” or a denial to equal opportunity, regardless of race. Yet, it is important to underscore here that the category of Asian-American is being employed strategically as a catch-all protected class to eliminate race as a factor for consideration in admissions policies. In its specificity, Asian-Americans in the United States are further broken down to include individuals who self-identify as Chinese (not Taiwanese), Indian, Filipino, Vietnamese, Korean, Japanese, Pakistani, Cambodian, Thai, and eleven other Asian and Pacific Islander groups. Self-identified Chinese are the largest group, although in 2016 they made up only 22 percent of all Asian Americans living in the United States. Today, they are at the forefront of this lawsuit, leading the fight against affirmative action. 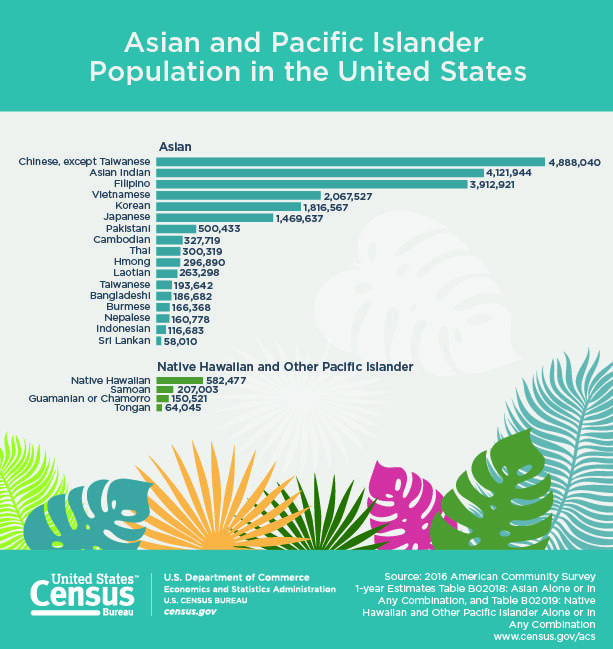 “Asian and Pacific Islander Population in the United States,” United States Census Bureau. May 3, 2018. Asian-Americans make up 22 percent of all Harvard-admitted students, but plaintiffs assert that if only academic achievement were considered, Asian-American population would be as high as 43 percent. At the same time, perfect standardized test scores and grade point averages, many studies have shown, are not signs of academic potential, but of wealth. Correlation studies show that students from families earning more than $200,000 a year average almost a perfect SAT score, whereas families earning $20,000 a year average four hundred points less. On average, families spend between $3,500 and $5,000 on test preparation, and wealthy families spend upwards of $75,000 on private tutoring each year. Tests, many have gone to argue using these correlation studies, favor the rich, educated families that can pay for tutoring and preparatory testing. The Harvard affirmative action lawsuit has spurred debates among prominent economists on the statistical measurement of racial discrimination. These debates are led by the findings and models employed by the world-class economic experts: the plaintiff’s Peter Arcidiacono from Duke University and the defendant’s David Card from the University of California, Berkeley. Card, as well as sixteen other leading economist and statisticians, including a Nobel laureate and four former Chief Economists, have argued that Arcidiacono’s data, which shows that Asian Americans suffer a “significant penalty” in comparison to white applicants, is misleading. A large reason why, they stated, is that Arcidiacono’s methods analyze racial discrimination in an idealized system, rather than in an actual system as per the policies employed by Harvard. Card’s model, which accounts for quality of an applicant’s high school, parent’s occupations, as well as the personal rating—and which factors for race and wealth—finds no significant difference between whites and Asian-American applicants. According to both experts, if legacies were excluded from statistical analysis, Asian-American applicants are admitted at a similar or higher rate than white students, but at a lower rate when included. The gap is significant. Harvard admits more than 33 percent of legacy applicants, while only admitting 6 percent of non-legacies. This disproportionately favors white students: more than 21 percent of white admitted students are legacies, compared to just 6.6 percent of Asian-American. The evidence for socio-economic and racial discrimination with regards to legacies has long been abundantly clear, but it is technically inconsequential in the lawsuit against Harvard University. That is, the case revolves around whether Harvard University’s policies discriminate based on race when all variables are controlled, including the legacy condition. Thus, the question becomes: are non-legacy Asian Americans unfairly disadvantaged in relation to other applicants from different racial backgrounds? When accounting for wealth, the answer is resoundingly no. Legacy policies are an archaic system, remnants of institutionally and federally sanctioned racial discrimination, which continue to reproduce centuries of systemic discrimination. These generate white wealthy institutions, yet they are not against the law. Despite this, the anti-affirmative action new elite claim entitlement to the promises of the meritocracy myths: complete access to upward mobility. Ivy League schools present an abundance of opportunities, including recruitment for employment and enrollment into powerful social networks that become useful throughout life. Thus, it seems increasingly urgent that the fight for affirmative action today also be an intersectional struggle that addresses both race and wealth, especially because the latter is currently out of the purview of antidiscrimination laws. We could start, perhaps, in our institutions by challenging the policies that actually hinder opportunity. Luzilda Carrillo Arciniega received her PhD in anthropology from the University of California, Irvine for her dissertation “Diversifying Capitalism: Race, Value, and the Making of the Corporate Workplace after Affirmative Action.” She is currently a lecturer at the California State University, Long Beach.